Custom-made Wedding packages in presentation boxes. A wide range of Hawaiian jewelry items to choose from including bangles & bracelets, earrings, rings, pendants and more. Choose from the wide range in both the online Hawaiian jewelry catalogue and the downloadable complete Hawaiian jewelry collection (available from the home page link). Custom-made Hawaiian Wedding packages in presentation boxes are available, please email us for details. 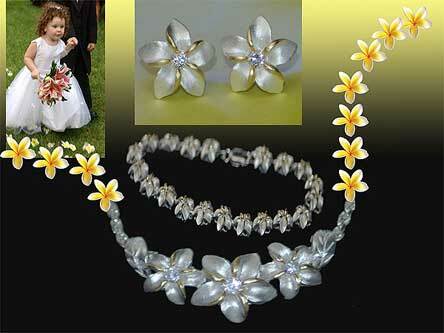 Sterling Silver and solid 14 carat gold Hawaiian wedding packages available in many different Hawaiian designs. The choice is almost endless! So much of the Hawaiian jewellery range is suitable as bridal jewelry, in particular jewellery featuring the Hawaiian Plumeria, frangipani, flower. Choose a selection and contact for a package price. For package discounts, both Hawaiiaan pendants and necklace chains must be purchased together.